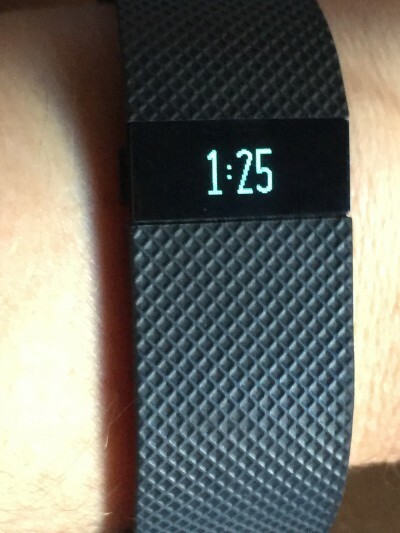 Enter my new Fitbit Charge HR! Gotta say, I love this thing! It does take some getting used to on the wrist, especially if you’re not used to wearing a watch, and it is a watch. But, it does so much more, that with me being technologically challenged, it will probably take me a long time to learn how to use every feature. 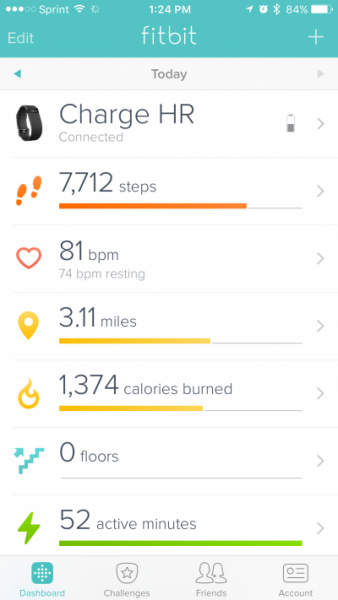 There are a few Fitbit models, but the main reason I actually wanted this one was to be able to track my heart rate without wiring myself up. The HR does a pretty good job at that. It wirelessly syncs to your smart phone and/or computer. I can look at the read out on my wrist or on my phone while working out and it seems to do what it’s supposed to do. I checked my heart rate monitor while checking my heart rate on the opposite wrist with my Blood pressure monitor and they both red exactly the same, so I’m going to say this works! 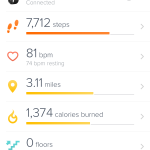 My next favorite feature is that it counts your steps! I thought being that I did a lot during the day, cleaning, laundry, errands, etc, that I was walking a lot. Hah! It takes a heck of a lot of steps to equal 10,000! I have to admit, it’s pretty fun working out and watching the step count go up. I have it linked to my phone so I can set my phone down and open the Fitbit app and viola’ I can watch my steps counting up. What’s really funny is, if it’s near the end of the day, and I haven’t gone 10,000 steps, I pace around the house until I do. Sometimes I just stand in front of the tv and march, because, ya know, I’m obsessed and I gotta get to 10,000! It’s such an awesome feeling of accomplishment when you hit that goal and the Fitbit vibrates on your wrist! It also counts steps, so you know how many floors you’ve climbed! Another feature is the food/calorie tracker. You can set your goals by entering your current weight and how much you’d like to lose. Enter everything you eat during the day (no cheating), from breakfast to dinner and snacks in between. It will track your calories and tell you how many you have left to use. It adjusts during the day. As you move around more, it gives you more calories. You can enter your foods in one of three ways, search and find, manually, or scan the barcode on the package. You can also keep track of how much water you drink. You might be surprised at how much you really are not drinking. Adding your friends is a great feature and motivator. You can compete with them and taunt them. Most important is that you are held accountable for what you are eating and how much moving you are doing. It’s amazing how things change when you feel everyone is watching you. 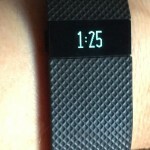 You can also track your sleep, although I have not tried this feature yet. Also, if you sync it with your phone, it actually vibrates when you get a call and it has caller ID so you know who’s calling! The only negative I can see is that, if you’re not moving your arms, it doesn’t seem to count your steps accurately. Such as pushing a shopping cart. Your arms have to move along with your feet. So if you’re riding a bike this probably wouldn’t work as far as steps but it would allow you to track your heart rate and everything else. My opinion? If you want to lose weight, get healthy, keep track of your eating, movements, heart rate, and sleep, and more, then join me and get a Fit bit Charge HR!